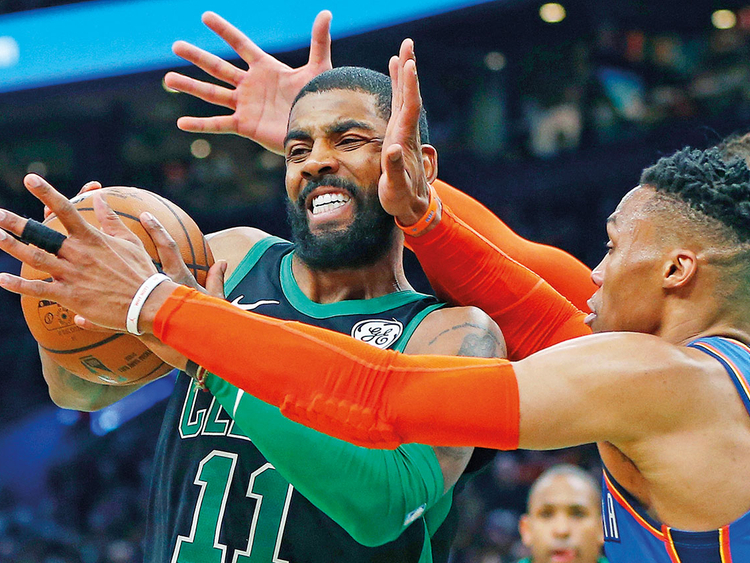 New York: Kyrie Irving scored 30 points and passed out 11 assists on Sunday as the Boston Celtics snapped Oklahoma City’s seven-game NBA win streak with a 134-129 home triumph. Marcus Morris added 19 points and Marcus Smart netted 18 as eight of nine players taking the court for Boston scored in double figures and the Celtics improved to 34-19, matching Philadelphia for third in the Eastern Conference. The Thunder fell to 33-19, four games adrift of Western Conference leaders Denver and Golden State, despite a sixth consecutive triple double from Russell Westbrook, who had 22 points, 16 assists and 12 rebounds. At Toronto, the host Raptors ripped the Los Angeles Clippers 121-103 behind 18 points from Kawhi Leonard plus 16 points and 12 rebounds from Congo-born Spaniard Serge Ibaka. Canada’s Shai Gilgeous-Alexander, a 20-year-old guard playing in his homeland, led the Clippers with 19 points. Memphis guard Mike Conley scored 25 points and Spanish big man Marc Gasol added 24 to spark the Grizzlies over the NBA-worst New York Knicks 96-84 at Madison Square Garden. Conley added eight rebounds and seven assists while Gasol contributed nine rebounds and five assists for Memphis, who also had 19 points from Justin Holiday.